Bobcats Still Pursuing Stephen Jackson Trade? …further checking reveals that the Bobs have seriously explored the prospect of trading for Jackson, apparently undaunted by the fact that they weren’t mentioned when Jackson announced late in the summer that he wanted to be dealt to Cleveland, New York or one of the three Texas teams. It remains to be seen how far the Bobcats are willing to go, since taking on Jackson’s contract doesn’t exactly sound like owner Bob Johnson’s kind of move. For the record, the remaining years on Jackson’s contract are: ’09-’10 $7.65 mill, ’10-’11 $8.45 mill, ’11-’12 $9.26 mill and ’12-’13 $10.06 mill. Stein goes on to report that the Bobcats might be dangling Boris Diaw as trade bait, as Larry Brown has supposedly grown frustrated with the laissez-faire Frenchman. First of all, I hope that this is one of those rumored trades that gets reported in the media, but never comes close to happening in real life. I’m by no means a Boris Diaw fanboy (too many TOs, not enough rebounds), but he’s far from the biggest problem with the Bobcats. Additionally, it would likely mean that we’d go small with Gerald Wallace playing at the 4 — going small is always fun, but it’s also risky for the wispy, reckless Wallace. Oh, and I can’t decide what’s more insane, Stephen Jackson’s contract, or Stephen Jackson himself. On the other hand, it does make some sense. A motivated Jackson would go a long way towards improving our offensive output. (Not saying Jackson would necessarily be motivated here, just saying hypothetically, a motivated Jackson would solve some of our offensive issues.) And a trade with Jackson and Diaw as the principals is a lot more likely than many of the super-dreamy fantasy trades that get bandied about here on Bobcats Baseline. If we expect to get a little financial relief (by also dumping in Nazr’s contract) and improve our offense in one fell swoop, it’s probably going to be by taking on someone else’s malcontent (i.e. 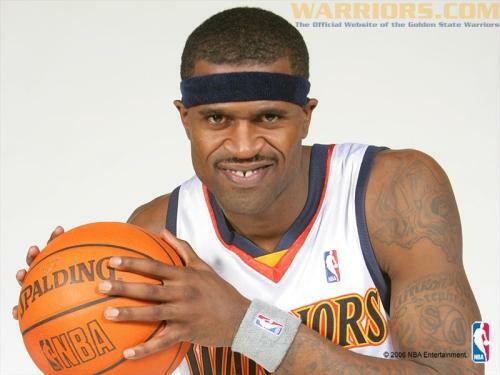 Stephen Jackson, Prince of the Malcontents). We’re not going to get the young, squeaky clean, 40pt scoring cornerstone of another franchise (Kevin Martin or Andre Igoudala). we COULD very well pry Kevin Martin from Sacramento–in a cost cutting move from Sacramento. we COULD also pry Andre Igoudala IF another trade partner was able to convince Philly that the trade was worth it (to me, Steven Jackson, Nocioni, AND a future first rounder for Iggy sounded damn good truth be told). but that is the obstacle. Sacramento would be receiving expiring contracts for Martin, and i think thats enough to get him in the QC. Diaw isn't going anywhere. Larry Brown's minions are just feeding that to the media as a way to motivate Boris to get back into shape. If anything the 'Cats may be contemplating sending Wallace to Golden State for S-JAX (see my post on "Getting Realistic"). The whole Stephen Jackson trade rumor sounds like a Marc Stein is just pretending to work. I mean, how many potential trades has this guy "reported" that have never happened. I just don't see the Cats bringing this guy in. Their marketing appeal is shaky at best. The Warriors could handle him, because Oakland has done this kind of thing with Raiders players for a decade. Maybe the marketing crew could do a "Get Punched By Captain Jack Night"